How does killing zombies in a video game have anything at all to do with this year’s Tony Award winner for Best Play? In The Curious Incident of the Dog in the Night-Time, on-stage technical wizardry helped tell the tale of a young boy’s coming to terms with dark truths about his parents. The projection mapping, choreography, and sonic landscape all contributed to a sometimes overwhelming, sometimes claustrophobic look at disaffection and alienation. 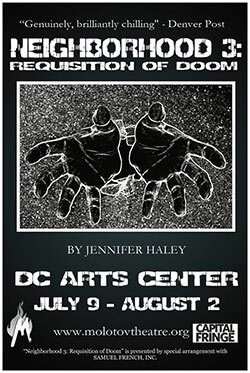 We’ve taken some cues from that production in Molotov Theatre Group’s upcoming Neighborhood 3: Requisition of Doom by Jennifer Haley (July 9 – August 2 at 7:30 at DCAC, 2438 18th Street, NW, in Washington, DC 20009. Directed by David Dieudonne and Assistant Directed by Elliott Kashner, with musical composition by Gregory Thomas Martin, Molotov’s Neighborhood 3 also uses projection mapping and a wonderfully creepy musical score to build a looming sense of dread in another story of what goes on in today’s modern families. Projection mapping and set construction by Rachel Marie Wallace, lighting by Pete Vargo, fight choreography by Mallory Shear, and stage management by Katherine Offutt provide a technical foundation for Neighborhood 3 that absolutely presses against the ceiling of what can be done in the intimate space of DCAC. It’s a story absolutely perfect for DC’s only Grand Guignol-inspired horror theatre. Many a curious incident happens in the night-time in Neighborhood 3, but the play parts ways from the Broadway hit when looking at the alienation of today’s youth. Author Jennifer Haley riffs off the story of British teen Warren LeBlanc, who in 2004 brutally killed a friend after becoming too immersed in the video game Manhunt. Haley looks at how a psychologically addictive video game, tied to continually improving online technology, can blur the line in players’ minds between what is real and what is imaginary. For the uninitiated to Grand Guignol, the French theatre of horror forms the backbone of Molotov Theatre Group’s work. The horrors of Grand Guignol were not the product of Victorian nightmares, but modern day horrors including technophobia and misanthropy. A show like Neighborhood 3 is perfectly in keeping with this subject matter. The growing instability of the nuclear family is a true horror, brought about by the consumer-driven society in which we live. Parents in Neighborhood 3 routinely use lines like “we’ve given you everything” and “we give him everything he needs” – phrases that underscore that materialism has taken the place of true parental affection. But you can only replace feelings with things for so long before the tears in the fabric start to show. It’s little wonder that the video game in Neighborhood 3 focuses on killing zombies that threaten to take over the neighborhoods that the play’s young people. To them, parents are little more than zombies, herdlike and slavishly pursuing the things that sustain them and offer some meager substitute for true human interaction. The sad reality is that these parents know longer understand how to make contact with their children, and that alienation causes the young people to act out however they can, if only to prove to themselves that they still have meaning in the world. *You must have a Capital Fringe button when attending these performances also. FOR TICKETS, CALL: (866) 811-4111, OR PURCHASE THEM ONLINE.